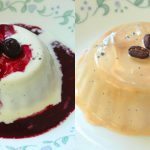 Keto Panna Cotta - Headbanger's Kitchen - Keto All The Way! There’s seriously no easier Keto dessert than our Keto panna cotta. It takes less than five minutes to make (though it takes the utmost patience to wait for it to set), needs just three basic ingredients, is super versatile and is ridiculously low in carbs. Make our version, or put your own twist on this Italian dessert, but eat this creamy, delicious low-carb panna cotta today! Enjoy! We’ve got tons of Keto recipes on that website and that includes desserts too. So try our flourless Keto chocolate cake, or perhaps our Keto berry cheesecake for something fruitier. In fact let me know what your favourite dessert is in the comments below. Using the tip of the knife, scrape the seeds from the pod and add them to the cream. Once the cream begins to just simmer, take it off the heat. Discard the vanilla pod, leaving just the seeds inside. Add the gelatin to the cream and mix well until it’s completely dissolved. To unmould the panna cotta, dip the moulds briefly in a bowl of hot water, then upend it on a plate. Serve topped with mixed berries. I think the recipe meant 1 teaspoon of gelatin because that is what the video stated? Will fix that now. Thanks for spotting it. Can you give measurement for sweetener? I typically use a Stevia/Erythritol combination. Cathy it’s best to give it a taste and add as much as you like. Honestly it seems everyone’s Stevia brand is different and it’s hard for me to give you an exact number. IN fact the brand I use I needed 12 drops and then when they changed their recipe I started to need 4 drops. So that’s the reason I tell everyone keep tasting your food as you go along the recipe. Can we use powdered form of stevia instead of liquid if yes then olease state the quantity too. Yes that’s fine. I can’t give you the quantity because I don’t know how sweet your stevia is. You will need to add it to the cream and keep tasting till it’s as sweet as you like. I use swerve powdered sugar sub and its just about the same as using regular 10x sugar. Also, if you can have just a few more carbs add in whole fat sour cream or plain greek yogurt, use the highest fat content you can find. This will add texture and a much creamier profile. There are quite a few different sweeteners out now and many are 1 to 1 substitutes.